If you follow me on Instagram then you knew this recipe was coming your way. I have been trying to eat pretty clean since the New Year (minus the Bojangles and Pizza I consumed last weekend). I like to make a salad at the start of each week to have for my lunch everyday. Saves money and then lunch is easy no planning necessary and it's healthy. I made this salad this week and it knocked my socks off. 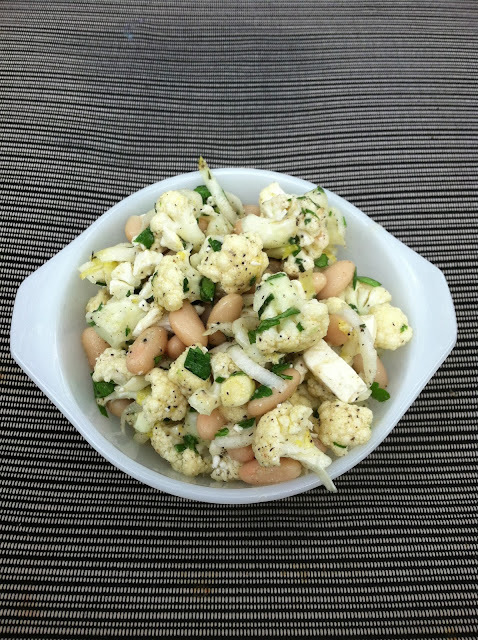 If you love Cauliflower then you will love this salad. The flavors are so fresh, light, and delicious. I think it would be killer with some grilled Shrimp if you wanted a heartier meal but it was perfect alone for lunch. I love that the cauliflower is raw and not cooked- most recipes call for it cooked. The raw crunch of the cauliflower adds some great texture. All the fresh herbs and feta really give the salad amazing flavor. I promise you will be hooked on this. I am on day three of eating it and still not sick of it! Ummmm this looks delish and as is if it might combat the 2 blts with avocado I had last night. Fatty!!! This looks absolutely delicious, love the colors! Yum, you know I like all things salad-esque! That looks amazing--and not too difficult to make. Does it start to get soggy after a few days though? Yum! Adding this to my list of things to make!! This looks yummy! I am going to try it. I struggle with what to have for lunch and get sicks of sandwiches. this looks great. I never thought to add cauli to salad! For some reason the combination of beans and cauliflower is so interesting! And I always love feta! Looks like something I would love!!!! Always enjoy your food posts!!!! this is looks incredible - so pretty too! 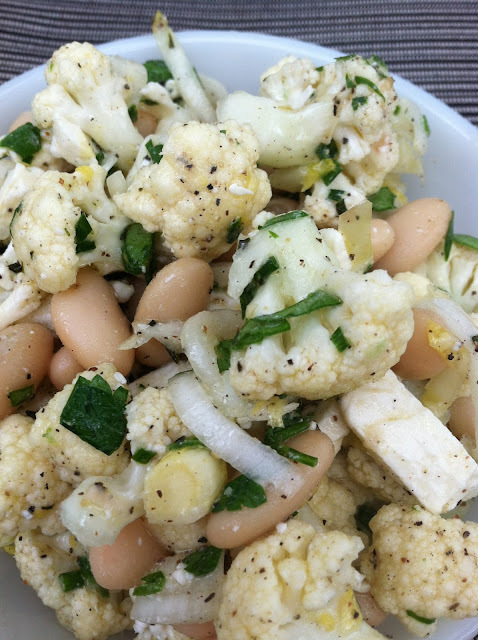 I love cauliflower and white beans. Definitely going to make this!! I posted a recipe on my blog today too. I want to stick my fork through the screen and eat this deliciousness. Made the salad last night, it was awesome! The whole house loved it!! Thanks for the recipe!! I just made this (modified a few things I didnt have) and it was soo delicious!! Your recipes are great, thanks for sharing and keep them coming! I just made this and it is delicious! Thanks for posting. Finally made this tonight! YUM!! Now I am looking forward to lunch all week!